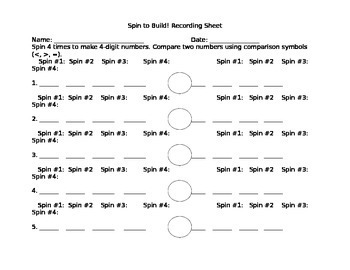 Students can use spinners from the Dollar Tree or from the Lakeshore game Spin to Build. I had the spinners but I did not have the copy for the recording sheet so I made my own. They spin for each digit and then have to keep spinning to make two 4-digit numbers. Then they have to comparison symbols (<, >, =) to figure out which number is bigger.